When Super PAC contributions and dark money are taken into account, David and Charles Koch spent over $412 million during the last election cycle. The Wall Street Journal’s Kimberley Strassel either has no understanding of campaign finance, or is willfully misleading her readers. In either case, her column today about the Koch brothers’ political spending—which parrots a meme that has bounced around conservative blogs and websites like a bad chain e-mail—gets the facts about Koch spending versus union spending completely wrong. In her column, “The Really Big Money? Not the Kochs,” Strassel cites a Center for Responsive Politics list to claim that unions “collectively spent $620,873,623 more than Koch Industries” on political races. Of course, if you actually visit this page on the CRP website, the list runs below a disclaimer noting that it does not include certain Super PAC spending or most undisclosed dark money spending, the preferred route for the Koch brothers for decades. 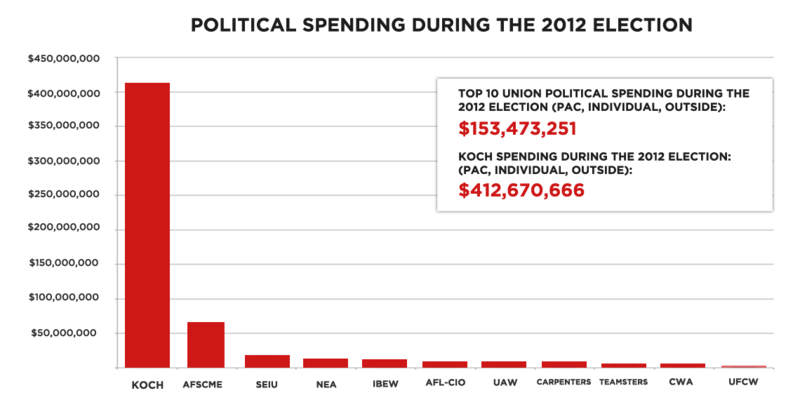 In fact, the CRP site notes that union spending might appear inflated since unions’ traditional PAC spending is coupled with outside Super PAC spending. For the purposes of this chart, union spending is inflated compared to the giving of companies like Koch or Super PAC donors like Sheldon Adelson. For the last election, Koch PACs spent $4.9 million in disclosed contributions (figures that appear on the chart referenced by Strassel). But they also spent over $407 million on undisclosed campaign entities, which does not show up in the CRP chart. Republic Report broke down the figures for the last election and found that Koch groups alone spent more than double the combined political spending (including to undisclosed group) for the top ten unions combined. The chart includes union spending on dark money Democratic groups and Koch spending on dark money groups like Americans for Prosperity. All NLRB-regulated unions, on the other hand, disclose every outside payment. Payments that cannot be found through the FEC can be found on a database maintained by the Labor Department. Individuals and corporations are under no such similar disclosure rules. The Koch money identified recently by The Washington Post, the $407 million, relates only to money filtered through foundations and nonprofits. The money Koch spends as a corporate entity, as it has in the past, may have gone unreported.